False color image of Caloris Basin (orange) on Mercury. Color images of Mercury reveal an unusual blend of mineral compounds in its surface structure. The planet Mercury is 4878 kilometers in diameter. The moons Ganymede and Titan are both larger, while Earth's moon is slightly smaller. Mercury orbits the Sun at a mean distance of 57,910,000 kilometers—a year on Mercury lasts a mere 88 days. Since Mercury rotates every 58.6 days, the planet completes three rotations for every two orbits about the Sun. Close proximity to the luminary means that temperatures on Mercury can reach 427° Celsius when the Sun is at its zenith. Being two-thirds closer to the Sun, Mercury receives an average of nine times more radiation at its surface than does the Earth. The searing heat, as well as intense bombardment by charged particles from the Sun, pose a dilemma for planetary scientists: Mercury has a thin but detectable atmosphere. How a planet with such a weak gravity field (only 38% as great as Earth) and with so much "erosion" by solar radiation can retain the smallest remnant of an atmosphere is a mystery. As we discussed in a previous Picture of the Day about Saturn's moon Titan, weak gravity fields are not supposed to be able to keep atmospheric gases from leaking away into space. Ancient moons are thought to be airless deserts because whatever gas they once held has long since been "weathered" away by the solar wind. Ions tend to drag gases and dust away from the moon, like a stream of water dissolving a riverbank. Gradually, the atmospheric density falls to zero and nothing remains to protect the surface from meteoric bombardment or coronal mass ejections from the Sun. According to consensus opinions, this is why so many moons look alike and why they have no atmospheres: they have all undergone similar evolution over billions of years. Titan, and now Mercury, have called such presumptions into question, however. With Titan, mission engineers have speculated that there is some form of gas generator on the moon, replenishing its frigid methane atmosphere. On Mercury, where cold is not the issue, the solar wind is thought to be powerful enough to knock particles off the surface rocks, leaving the ions to recombine suspended in near orbit, weakly held by the gravity field. Since the molecules are not able to persist, satellite probes like MESSENGER can detect them during its planetary flybys as they leak away. The MESSENGER mission has also constructed images such as the one at the top of the page using eleven different color filters on its Wide Angle Camera (WAC). By combining the information from infrared, visible red, and violet filters, then running it through arbitrary red, green, and blue channels, a false-color impression of Mercury's surface composition can be displayed. While the colors are not truly what would be visible to the unaided eye, they allow geologists to visualize the variations in chemical distribution as well as how various features correlate to mineral concentration. 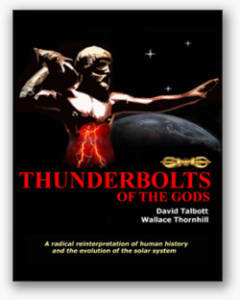 In April of 2009, NASA’s THEMIS satellites found "electrical tornadoes" about 60,000 kilometers above the Earth at the interface between Earth's magnetosphere and the solar wind. During the most recent MESSENGER flyby of Mercury, similar flux tubes were found, connecting its magnetic field directly with the Sun through twisting Birkeland current filaments. 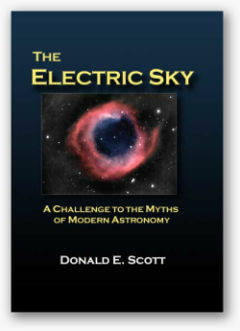 Birkeland currents are well-known to plasma physicists and Electric Universe proponents. 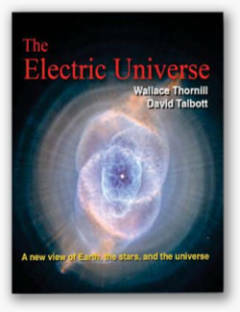 They act as cosmic transmission lines through space, confining plasma within their vortices and allowing electric currents to flow over great distances. As we have suggested in the recent past, rather than reckoning celestial bodies like Titan or Mercury to be geriatric denizens of a wizened Solar System where whatever catastrophes that might occur have long since run their courses, it is more reasonable, given the anomalies detailed for many years in the Thunderbolts Picture of the Day, to think of them as youthful members of a dynamic ensemble. There might have been a period in Mercury's history when those helical currents were energized to the glow mode or the arc mode stage. If that happened, then the surface of Mercury would have been the scene of gigantic electric discharges blasting out craters, cutting vast chasms, and rearranging the atomic structure of the planet's crust over large areas. 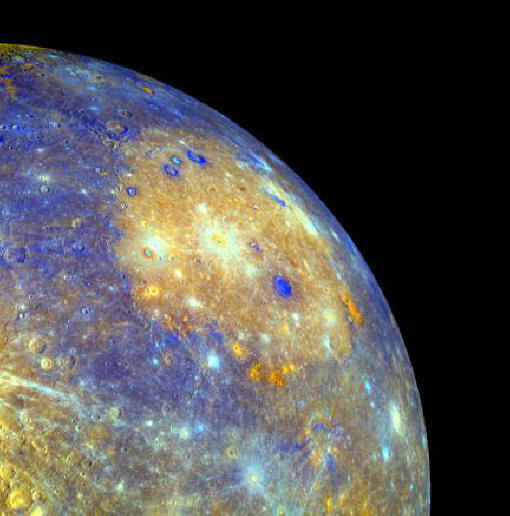 Caloris Basin and the altered materials in the craters could be part of what has been left behind after the increased electrical energy through Mercury's structure dissipated.